It's gone viral. NPR and Gawker have celebrated the work. Literature and poetry professor Michael Dumanis was quoted as saying "It captured the truth about personal space. The misspellings make it more primal and deliberate. At the end there's an epiphany about dancing and what that means." Of course, the first grader spelled the words the best he or she could, so this poet wasn't really primal but, in some ways, deliberate. I can only imagine how some educators might respond to this poem, especially one written in April (National Poetry Month) and so close to the end of the school year. They're looking at their standards and they're worried about "swrld" and "danst" and "lisin" and "mozik." They're worried about the child's inability to hear certain consonant or vowel sounds. 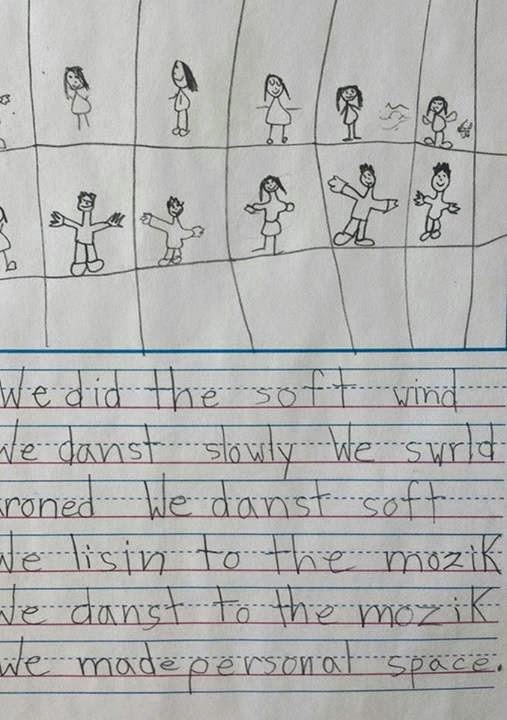 To be honest, "mozik" puzzles me a bit because I wonder how this poet speaks the word "music." But no matter. I agree with much of the gushing: the imagery of the poem is lovely. And it is impressive for a first grader. What I hope doesn't get lost is that it's much easier to teach a student how to spell than it is to try to capture this kind of abstract thinking and beauty. I hope that well-meaning teachers don't damage the sensitivity and the creativity for the sake of spelling. Kids and coding. Yep, it can make a difference.